Chelsea dumped Frank Lampard’s Derby out of the League Cup on Wednesday despite a valiant effort by the Championship side to battle back from a defensive Halloween horror show. Maurizio Sarri’s much-changed side eventually emerged 3-2 winners, with all five goals coming in a helter-skelter first half, on a night when there were also fourth-round victories for Arsenal, Tottenham and Middlesbrough. Two astonishing early defensive errors at Stamford Bridge from Fikayo Tomori — on loan from Chelsea — and Richard Keogh either side of a Jack Marriott equaliser gave the home side a 2-1 lead. Undaunted, Lampard’s side levelled shortly before the half-hour through Martyn Waghorn before Cesc Fabregas restored order for the Premier League high-flyers. 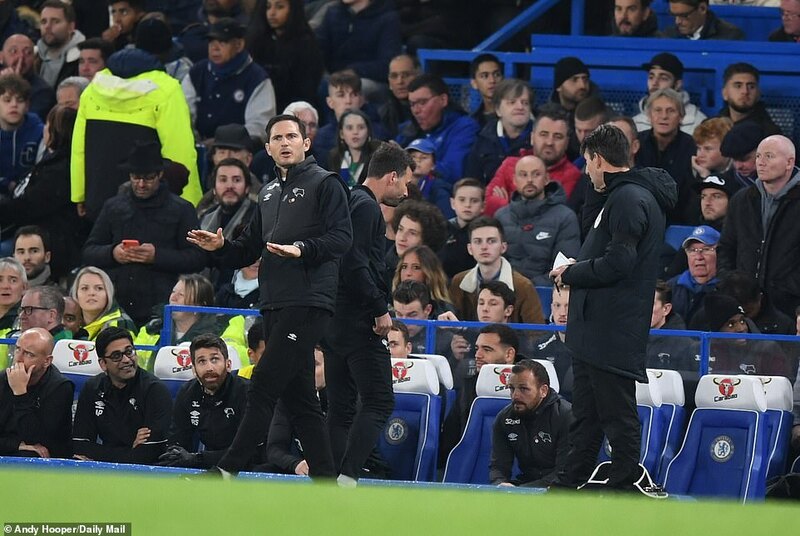 Lampard, one of Chelsea’s greatest-ever players, received a rapturous reception on his first return to Stamford Bridge as a manager, soaking up the atmosphere before kick-off. Buoyed by his side’s win at Old Trafford against his former Chelsea boss Jose Mourinho in the previous round, he was dismayed to witness the errors from his side, which made their task all the harder. As former Chelsea and Leicester manager Claudio Ranieri looked on from the stands, there was a minute’s applause before kick-off in tribute to Leicester’s late Thai owner Vichai Srivaddhanaprabha, killed in a helicopter crash on Saturday. Two goals from Son Heung-min and a strike from Fernando Llorente gave Tottenham a 3-1 win against West Ham while Championship side Middlesbrough upset Premier League outfit Crystal Palace 1-0.